I made my own version of a Mimi Pizza, with darn good results. My pizza go-to at Punch Pizza is the Mimi. They bake a pizza crust in their wood-fired oven, pull it out of the oven, and then pile it with fresh grape tomatoes, basil, fresh mozzarella, extra virgin olive oil, and garlic. I'm a sucker for the contrast in temperatures and the unexpected twist of the raw tomatoes and cheese on a pizza. For book club, I attempted my own version of the Mimi, using some of my favorite local ingredients. I used fresh, local mozzarella, organic cherry tomatoes from Wisconsin, and organic basil from my garden. I even used organic flour from North Dakota in the crust. For the dough, I used a variation of Peter Reinhart's Napoletana pizza dough recipe. It's a bit time-consuming, but not rocket science, and it results in a fantastic, chewy-on-the-inside, crusty-around-the-edges crust. I've used this dough recipe both on the grill and in an oven cranked as high as it would go (preheating the pizza stone). 1. Using an electric mixer fitted with the dough hook mix together all the ingredients on low speed for 4 minutes or until all the flour gathers together to form a coarse ball. Let this rest for 5 minutes then mix again for an additional 2 minutes, until the dough clears the side of the bowl and sticks a bit to the bottom (add a bit more water if too dry, or flour if too wet). 2. Put the dough onto a floured surface, dust the top with flour to absorb the surface moisture and then form the dough into a ball. Put the dough ball into lightly oiled bowl turning the dough over to coat, cover the bowl with plastic wrap. Let sit at room temperature for 30 minutes before refrigerating overnight. 3. On the following day remove the bowl from the fridge 2 hours before you plan on making pizzas. Using wet hands gently remove the dough from the bowl and place on a floured surface, trying to deflate the dough as little as possible. Divide the dough into 4 equal pieces, gently rounding each into a ball. Line a baking sheet with parchment and brush with olive oil. Place the pieces you intend to use that day on the sheet and loosely cover with plastic wrap. Let the dough sit out for 2 hours before making into pizzas. You can now freeze any of the extra dough balls in individual food bags (still oil the dough). 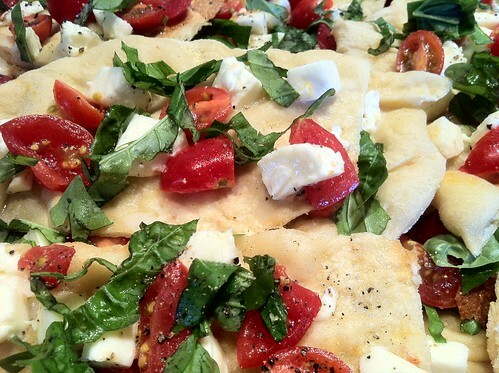 Use the refrigerated dough within 2 days and the frozen dough within 3 months. 4. An hour before you make pizza pre heat the oven to its highest setting, with you pizza stone on the middle shelf. 5. To shape into pizzas place the dough on a floured surface and firmly but gently flatten with floured hands to about an inch thick. Use your fingertips press into and around the edge of the dough, turning it as you do, and continue in a spiral fashion, turning and pressing as you work your way to the center. You want to stretch the dough to about 10 inches. 6. Move the dough to the ‘peel’. Make sure it can move freely by sprinkling the peel with cornmeal. If you don’t have a peel (not exactly common kitchen equipment) use an inverted baking sheet dusted with cornmeal. 7. Transfer the pizza to the baking stone and cook until the crust is puffy and slightly charred, about 9 minutes in my oven, but your oven will probably vary so watch carefully. You'll need about 8 minutes on a 500 degree grill. 8. In a bowl toss together quartered cherry tomatoes, cubed fresh mozzarella, roasted garlic, extra virgin olive oil, salt, and pepper. Pour the mixture over the warm crust. Sprinkle a chiffonade of basil over the top, and serve immediately. Worth noting: I used less olive oil than Punch does, as a matter of taste. Also, eat it immediately. Why? After sitting for awhile, the temperature of the ingredients levels out, and it's better when the cheese and tomatoes are cool and the crust is warm. I just love to eat pizza and it is my favorite, This is a nice process to make this recipe which is easy to make through your tips. Get the top quality of commercial Dough Press Machine at budget price.